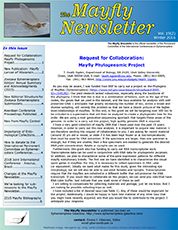 The Mayfly Newsletter (ISSN 1091-4935) is the official newsletter of the Permanent Committee of the International Conferences on Ephemeroptera and is published to facilitate communication among ephemeropterists. Its first volume was published 1990, and from then on long-time editor Peter Grant (Southwestern Oklahoma State University) updated ephemeropterists around the globe more than 25 years with useful information on mayflies and the mayfly community itself! Pete was the founding editor and kept the Newsletter going for an amazing 25+ years... The mayfly community owes Pete a big "Thank You" for so many years of service. 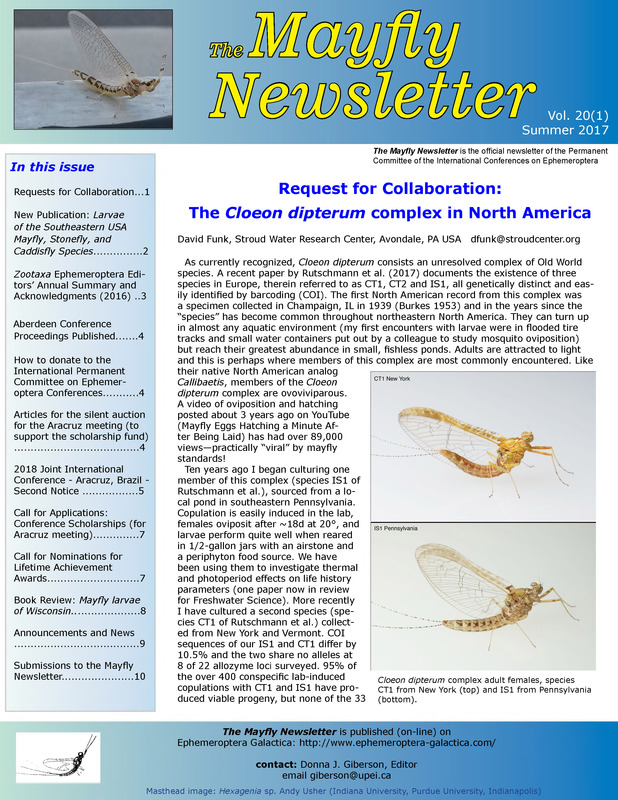 From this year on, Donna Giberson (University of Prince Edward Island, Canada) has taken over the responsibility as editor-in-chief, and from now on the Mayfly Newsletter will also be available online here on Ephemeroptera Galactica. All back issues are also available for download here at SWOSU Commons!